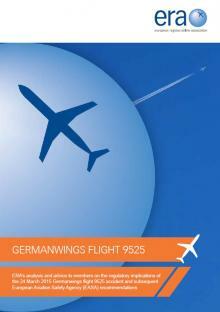 The Germanwings Policy document can be downloaded from the button above. This publication is the first in a series of ERA quarterly briefings of topical issues. Germanwings Flight 9525 was a scheduled passenger flight from Barcelona to Düsseldorf, operated by an Airbus A320-211, which crashed in the French Alps on 24 March 2015 with the loss of all 144 passengers and six crew members. The subsequent investigation by the French Bureau of Enquiry and Analysis for Civil Aviation Safety (BEA) determined that the crash was deliberately caused by the actions of a member of the flight crew, who was suffering from a long-term mental disorder for which his doctor had been treating him. The crash highlighted numerous issues surrounding the psychological profiling and evaluation of individuals employed in jobs that require a high level of safety awareness, responsibility and stress. The psychological profiling in respect to flight crew is a controversial issue as there is the obvious conflict of doctor/patient confidentiality versus the potential risk of a pilot losing their licence under medical (psychological) grounds, even though the illness may be a temporary condition. With professional ethics dictating that patient confidentiality should remain sacrosanct, there are questions as to whether this should still be applied when the individual is operating a commercial airliner. In the wake of the Germanwings crash EASA established a Task Force to examine the background to what happened and provide recommendations to prevent such a tragedy from being repeated. EASA held a workshop on 7 and 8 December in Cologne, which involved leading European and world-wide experts to debate the main challenges of implementing the Task Force recommendations. 2-persons-in-the-cockpit recommendation: Operators will be required to undertake a Safety Risk Assessment to determine (a) the operator’s psychological and security screening policy of flight crews; (b) employment stability and turnover rate of flight crews; (c) access to a support programme, providing psychological support and relief to flight crew when needed; and (d) ability of the operator’s management system to mitigate psychological and social risks. If the assessment leads the operator to require two authorised persons in accordance with EASA IR CAT.GEN.MPA.135 to be in the flight crew compartment at all times, operators should ensure that (a) the role of the authorised person, other than the operating pilot, in the flight crew compartment is clearly defined, considering that his/her main task should be to open the secure door when the flight crew member who left the compartment returns; (b) only suitably qualified flight crew members are allowed to sit at the controls; (c) safety procedures are established for his/her presence in the flight crew compartment (e.g. use of observer seat and oxygen masks); (d) training needs are addressed and identified as appropriate; (e) safety risks stemming from the authorised person leaving the passenger cabin are assessed and mitigated, if necessary; and (f) resulting procedures are detailed in the Operations Manual. Psychological evaluation of aircrew as part of training or before entering service: The operator shall ensure that a flight crew has undergone a psychological assessment before commencing line flying to identify psychological and behavioural factors which may interfere with the safe operation of an aircraft. Taskforce Recommendation to mandate drug and alcohol testing as part of a random programme of testing by the operator: The operator shall develop and implement a policy for flight and cabin crew, with related testing procedures, to avoid and prevent the misuse of psychoactive substances so that the safety of the aircraft or its occupants is not endangered. Without prejudice to provisions laid down in Directive 95/46/EC and to the applicable national legislation on testing of individuals, the operator shall develop and implement an objective, transparent and non-discriminatory procedure for the detection of cases of misuse of psychoactive substances by flight and cabin crew. This procedure shall take into account the provisions laid down in MED.B.055 of Regulation (EU) No 1178/2011. Task Force Recommendation to establish a robust oversight programme over performance of aero-medical examiners: National Authorities shall establish a renewal process for Aviation Medical Examiners required every three years and including a requirement to have conducted a number of EASA medical examinations during the preceding three years as well as attending an advanced course for AME’s, regular aeromedical conferences and meetings and with credit awarded for jump-seating, simulator experience and actual flying activities. Additional training covering psychological and psychoactive substances shall be provided. Finding an appropriate balance between patient confidentiality and the protection of public safety: A revision of the EASA Application form for a Medical Certificate template has been produced which guarantees medical confidentiality will be respected at all times. Additionally, the agency will establish an aeromedical data repository however, it was revealed that this will be an outsourced function and there was concern raised at the protection of patient confidentiality with the engagement of third party contractors. Pilot support programmes and reporting systems will be implemented through EASA’s requirement for the operator to enable, facilitate and ensure access to a support programme that will assist and support flight crew members in recognising, coping with and overcoming any problem which might negatively affect their ability to perform their duties. Such access shall be made available to all flight crew members. Implementing items 1, 2, 3 and 6 have specific and significant scope for operators, and indeed the conference was attended by a number of specialist organisations who are able to offer the necessary services to airlines to enable them to meet the mandate. ERA will try to identify a selection of experienced and competent service providers for consideration to those members who have not historically accommodated such expertise within their own organisations. It should be noted as well that EASA has recommended that as cross-cultural psychological evaluations do not apparently work with any degree of success, evaluators should be local to the individual or pilot workforce State. ERA will consult with EASA concerning the establishment of an EU Aviation Mental Health Professional Repository. Presentations available from the links on the left hand side of this page. On 9 May 2016, the Directorate attended the Aircrew Mental Health and Wellbeing 2015–2040 conference at the Royal Aeronautical Society in London. The main focus of the conference was to gain a clearer understanding of mental health issues, why they develop and how they can be treated. A summary of what was discussed during the conference can be found via the download button. EASA have now provided their Opinion to the European Commission and we wait for the rulemaking process to determine the implementation process and timescale. Opinion 14/2016 and other useful reference material is available from the links on the left hand side of this page.